We present a combined theoretical and experimental study of the electronic structure and equation of state (EOS) of crystalline PdN2. The compound forms above 58 GPa in the pyrite structure and is metastable down to 11 GPa. We show that the EOS cannot be accurately described within either the local density or generalized gradient approximations. The Heyd-Scuseria-Ernzerhof exchange-correlation functional (HSE06), however, provides very good agreement with experimental data. We explain the strong pressure dependence of the Raman intensities in terms of a similar dependence of the calculated band gap, which closes just below 11 GPa. At this pressure, the HSE06 functional predicts a first-order isostructural transition accompanied by a pronounced elastic instability of the longitudinal-acoustic branches that provides the mechanism for the experimentally observed decomposition. 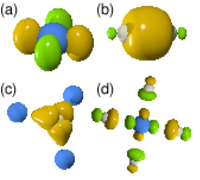 Using an extensive Wannier function analysis, we show that the structural transformation is driven by a phase transition of the electronic structure, which is manifested by a discontinuous change in the hybridization between d and p electrons as well as a conversion from single to triple bonded nitrogen dimers. We argue for the possible existence of a critical point for the isostructural transition, at which massive fluctuations in both the electronic as well as the structural degrees of freedom are expected.